The children of Gail Freeman’s fourth-grade class in the Bronx had no idea how unusual their curriculum really was. To them, the six-foot-tall, 200-pound robot dubbed Leachim that occupied one corner of their classroom probably belonged to a larger fleet of AC-powered educators. Students would approach Leachim, dial in an access code, and hear their names in halting, slightly distorted speech. Hello, Susan. How are you? Let us begin our lesson. Loaded with information about Freeman’s class, encyclopedia entries, a dictionary, and an irreverent sense of humor, Leachim spent three years interacting with students, prompting them to answer multiple choice questions by pressing Yes/No or True/False buttons installed on his chest. His inventor—Gail’s husband, Michael Freeman—had spent $15,000 of his own money developing a resource that could tailor lessons to a variety of ages and learning levels. Leachim was in use from 1972 to 1975, at which point Freeman began to grow tired of updating his database and setting time aside for repairs. He thought Leachim (an anagram for Michael) had the potential to be mass-produced in order to reach more children. With his light bulb eyes and relative immobility, Leachim was the prototype. It would be 2-XL who would fulfill Freeman’s ambition to have the world’s first smart toy. Born in 1947, Freeman’s interest in robotics had always been ahead of his time. At 13, he entered and won the Westinghouse Science Talent Search [PDF] with Rudy, a robot that could be pulled along on wheels and raise a drink tray when a button was pressed on his back. When Freeman became an assistant professor of computer sciences at Baruch University in New York in the 1970s, he developed the more advanced Leachim. Satisfied with the level of interactivity, he wanted to make it portable. “Little Leachim” was Freeman’s next project, an evolution of Leachim that appeared to have been hit with a shrink ray. At just a foot tall, Little Leachim could sit on a desk and pull from several recordings on an 8-track cassette tape to provide both questions and answers. He might, for example, inquire whether it was true that George Washington was the country’s first president. The user could press a button for either yes or no, which would then prompt the robot to congratulate or admonish the user, depending on his or her answer. Get enough right and Little Leachim would tell a joke; wrong responses earned his ire and a suggestion to study more. Freeman patented Little Leachim in 1975. By 1978, he had enticed the Mego Corporation—best known for their cloth-costumed superhero dolls—to mass-produce him for a wide audience. Mego developer John McNett renamed him 2-XL (“To Excel”) and, when presented with the issue of the robot being too generic-looking, grafted a chin onto the plastic mold using a discarded part from their Micronauts line. It took barely a year for 2-XL to charm his way into prime real estate in toy stores. Despite his substantial price tag—many retailers offered him for between $50 and $80—Mego moved more than 200,000 units by the summer of 1979, along with an untold number of 8-tracks covering everything from history to science. Industry observers who insisted an expensive educational toy was a recipe for disaster had been proven wrong. Freeman himself voiced the robot, which retained Leachim’s sarcasm; more than 2000 pieces of fan mail poured into Mego's offices each month. In an era where a computer with processing power could sell for hundreds or thousands of dollars, 2-XL stood out. Despite his educational ambitions, 2-XL was still relegated to toy shelves. And like most popular toys, he didn’t stay there for long. Declining sales prompted Mego to discontinue the product in 1981. Other interactive toys like Teddy Ruxpin appeared, marrying the appearance of sentience with a more appealing exterior. When 2-XL reappeared in 1992, new distributor Tiger Electronics gave him a facelift. He sported prominent arms and a more defined face. His eyes and mouth flashed in time with his speech, and his lessons (now on a standard audio cassette) were mixed with choose-your-own-adventure-style stories about Batman and the Teenage Mutant Ninja Turtles. Unlike the earlier model, he also ran on batteries. Like the original Mego version, Freeman provided his voice—a hyper, stylized delivery (“question” was pronounced “ques-tee-yon”) and jokes (“What do you call two banana peels? A pair of slippers!”) that gave him some charm. His popularity back on the rise, 2-XL came full circle back to Freeman’s original Leachim concept: a 10-foot-tall version appeared on Pick Your Brain, a syndicated kids’ game show hosted by Double Dare personality Marc Summers. The towering robot would ask questions and offer narration on the proceedings. Unfortunately, the show lasted just one season; in 1995, Tiger ceased production on the new version. In 2002, Freeman and Fisher-Price developed Kasey the Kinderbot, a more personable, LED-equipped toy aimed at preschoolers. 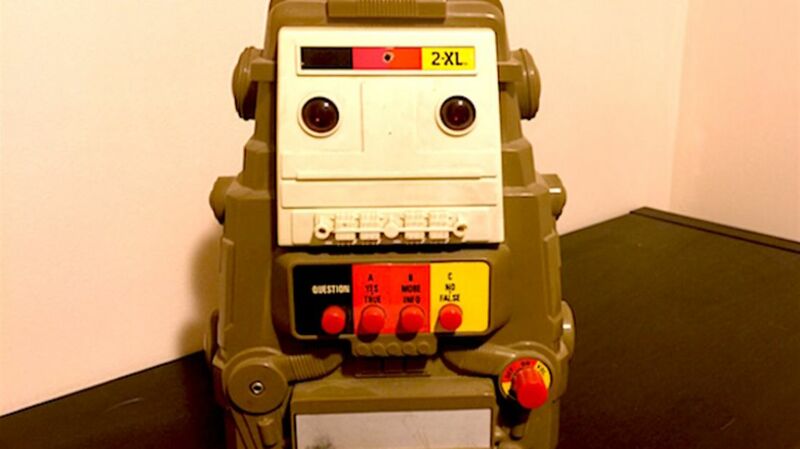 While the toy is impressive, it’s the original 2-XL who preceded Siri, Amazon’s Echo, and other two-way communicative devices to intrigue children who might otherwise be indifferent to an educational experience. In mimicking artificial intelligence, 2-XL helped encourage plenty of the real thing.